Welcome to Day 5 of the Consequences Audio Tour! If you’re in a hurry to listen to Chapter 5: THE WOMAN IN RED, run to ALYSSA LINN PALMER’s Author Blog RIGHT NOW! Me: Run run to ALYSSA LINN PALMER’s Author Blog to find out! I’d best introduce myself. I live in Calgary, AB Canada. I read a great deal, write every day (almost), and I like spending time with my cats, my family and my friends. I probably spend way too much time online, but I can’t help myself. I’m a member of the Romance Writers of America, the Calgary RWA local chapter, and the Rainbow Romance Writers (RRW). Don’t her books look lovely? You can get them at all the usual places, including Amazon from whence I snagged this screen shot. I’ve read and reviewed Alyssa’s most recent novel Midnight at the Orpheus before I really got to know Alyssa, and have since read and enjoyed several of her books–I’m really, really into the Le Chat Rouge series, and if you like your romance noir, I highly recommend them. Alyssa Linn Palmer’s blog is dedicated to “noir romance, gay & lesbian fiction, book reviews, thoughts on writing, French arts and culture, food, music, and literature” because… well, those are some of the things she’s passionate about. Alyssa’s most recent novel, Midnight at the Orpheus (Bold Strokes Books), is set in 1920s Chicago and it is an incredible, heart-racing read. What I love most about it is that until the last page… I had no idea how she was going to resolve her love plots. So. Good. 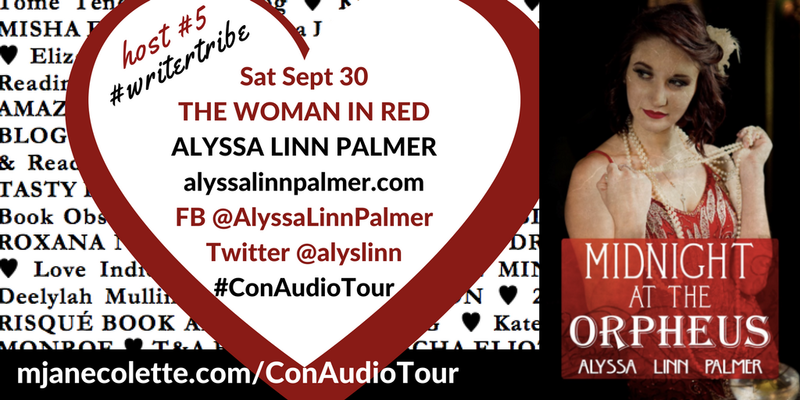 I’m so thrilled Alyssa is part of the Consequences Audio Tour, and it is so fitting that she is hoping the “Woman in Red” chapter! Thank you, Alyssa Linn Palmer!